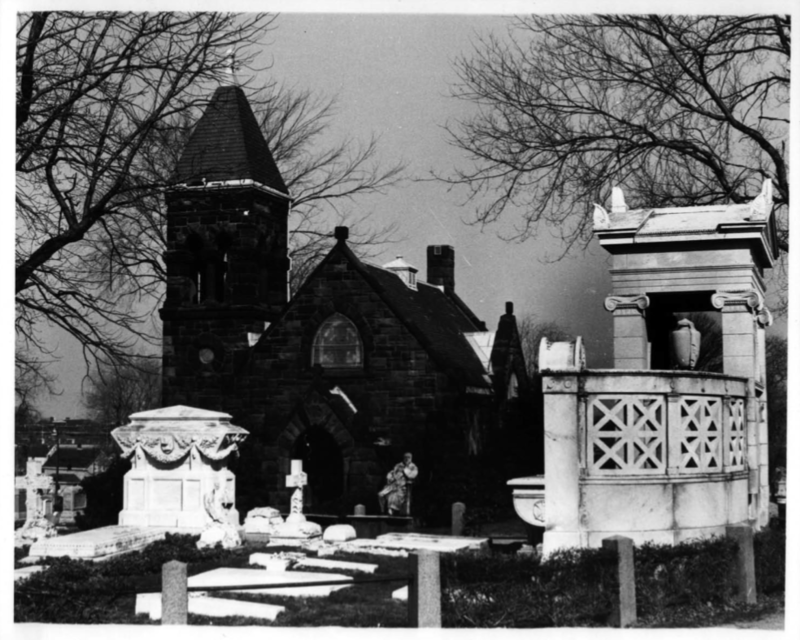 This photo dates from the early 1970’s and shows the Belmont family’s burial plot known as the Belmont Circle, with the chapel in the background. 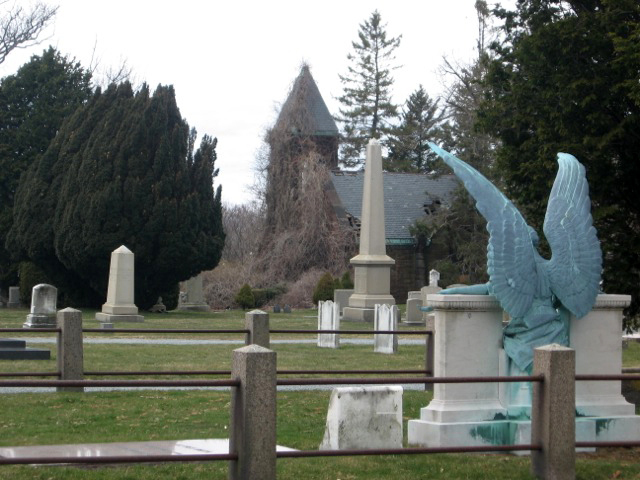 The sculpture of August Belmont, Sr. in front of the chapel has a history unto itself, and currently sits on the South/East corner of Bellevue Avenue and Narragansett Avenue in Newport on property owned by the Preservation Society of Newport County. Recognizing that the August Belmont Memorial Chapel is an architecturally and historically significant building, and is part of the social history of Newport, the founding members of the Belmont Chapel Foundation felt compelled to step forward as advocates on its behalf. Once our initial goal of removing the decades old plant growth from around the chapel is achieved, the Foundation plans to direct its focus on developing a master plan for restoring the chapel building and its architecturally significant features such as its stained glass. Ultimately the Foundation wants to see the chapel become an asset to the local community. At present the Belmont Chapel Foundation is exploring a variety of ways that the chapel building can serve both as a reminder of its original purpose and as a location for learning and exploration for present and future generations. 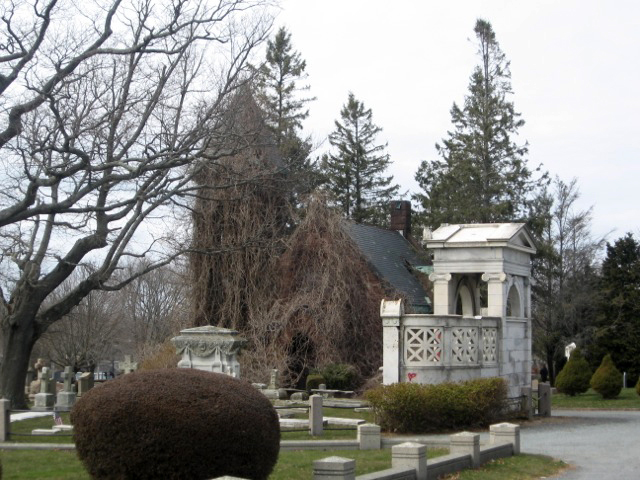 The Belmont Chapel, indicated by a blue marker on the interactive Google map below is located in Newport, RI’s Island Cemetery. It stands in the section bounded by Farewell Street, Van Zandt Avenue, Vicksburg Place and Warner Street. The closest address for GPS coordinate use is 67 Farewell Street, Newport, RI 02840. The latitude/longitude of the Belmont Chapel is: 41.497845 / 71.315668. You may click on the blue marker to activate the location and obtain detailed directions.